As crazy as it may sound, its absolutely true. Fast-food chain, McDonald’s has officially released their very first app and, you guessed it, it is marketed toward children. McPlay,released on May 1st for iPhone and iPad, has a snappy tagline that claims that your children can “Bring the fun of a Happy Meal with you, anytime and anywhere” and by that, they obviously mean a mini-game called ‘Happy Ball’. While I have been known to purchase the occasional Happy Meal for my children while running from a ball game to dance class, I cannot help but wonder if teaching children to associate fun iPad games with “junk” food is a great idea or not. While playing the games in the McPlay app, irony got the best of me. 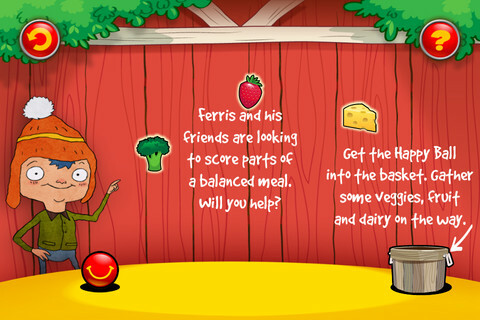 Contained within the app is a mini-game that prompts children to help a character named Ferris find all the parts of a “balanced meal”. Oddly enough, this involved broccoli, strawberries and cheese. While I appreciate what McDonald’s is trying to do here, part of me wonders if they would know broccoli if it hit them in the back of the head. While I find it interesting that even McDonald’s won’t promote their own chicken nuggets and cheeseburgers to children, I guess it could be worse; at least they aren’t suggesting that their Big Mac’s are part of a balanced meal. McDonald’s did get one thing right, however. This app does not contain any in-app purchasing opportunities, third-party advertising, or links to third party websites. With the current children’s app safety battle that is going on, at least there is no chance for kids to accidentally purchase any of that broccoli. Overall, McPlay is a fun app with cute mini-games that teach children to eat balanced meals. If you can get past the fact that it is being marketed by a corporation that likely has no real clue what a balanced meal is…you’re good to go!